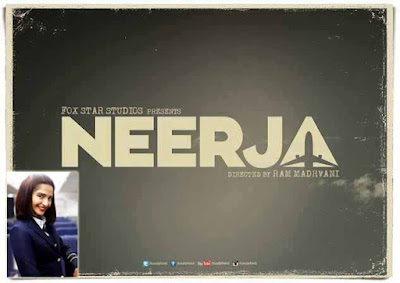 Mumbai : Fox Star India released the logo for the upcoming biopic drama ‘Neerja’. The logo has a vintage look displaying the title of the film and has an airplane embedded in it – signifying the hijack incident of 1986. The youngest woman to be awarded the Ashoka Chakra, Neerja Bhanot - , died saving 360 innocent passengers during a terrorist hijack on the Pan Am Flight 73 on September 5, 1986. She was all of 23. Directed by Ram Madhvani, ‘Neerja’ is a Fox Star Studios presentation of a Bling Unplugged and Fox Star Studios production. The film starring actors Sonam Kapoor and Shabana Azmi in the lead role, and is set for release on 19th February 2016. The fashionista of Bollywood and 'Khoobsurat' actress Sonam Kapoor is all set to fit in to the shoes of Neerja Bhanot, who was a Pan Chief Purser, shot to death by terrorists in a plan hijacked.